The intensity of this Monday’s rains and hailstorms in south central Chile affected many crops. Some producers have registered more damages than others. The question is to what extent this will this affect exports and employment in the region. The president of the Association of Fruit Exporters of Chile (Asoex), Richard Bown, said that the regions of O’Higgins, Maule, Ñuble, Bio Bio, and Araucania were affected by the weather event. The Minister of Agriculture, Antonio Walker, will travel to the affected areas, mainly to O’Higgins, in the coming days. The hailstorm caused serious damage to the production of cherries and other fruits, stated Giampaolo Dal Pane, president of the Dori Consortium, which has a big production and several producing partner in Chile. “It is difficult to know the real scope of the damage, but it is a catastrophe that affects an area of ​​300 km where only fruits, such as cherries, blueberries, apples, and pears, are grown. The grapes have taken the worst part, as well as the kiwis grown in open fields,” stated Dal Pane. “It is essential that producers prioritize meshes and covers to protect against calamities like this one,” he added. According to Asoex’ press release regarding the hailstorm, even though it is still too early to know the full extent of the damage, there is some data on its effects on specific products. According to the first reports, in the case of stone fruit (plums, nectarines, peaches and apricots), it seems that the most affected fruits were the late varieties, which are still in the flowering phase. Producers also reported that some fruits had fallen of the trees. 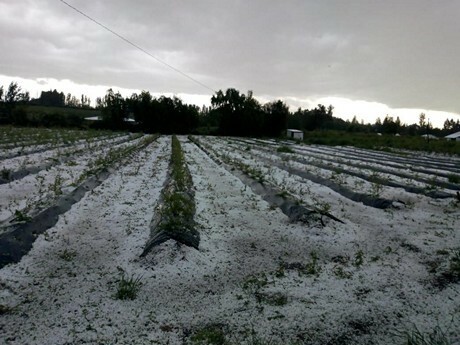 According to the Blueberry Committee, the hail affected the districts of Puente Alto, Paine, San Francisco, Graneros, Rancagua, Machali, Codegua, Requinoa, Retiro, Panimavida, Longavi, and Parral. The damages caused to the crops are being evaluated and, for the moment, it is still too early to state how much volume was lost. The committee decided to postpone its second harvest forecast until the week of November 19 to quantify the effects of the storm. According to the first estimates, nearly 5% of the cherry volume was lost. Jorge Ovalle Madrid said that the cherry export potential will decrease. “The damaged fruits are stone fruits, led by cherries. They suffered damages due to an over hydration caused by the rain, which cracks the fruit making it impossible to market. The fruit was also hit and has bruises, which will diminish its commercial quality, and some fruit fell to the ground. These damages complicate the sector, as this year’s production was smaller, due to the overproduction in the 2017 season and lack of cold hours in the winter of 2018, which led to a smaller amount of flowers and, therefore, of fruit. The Kiwi Committee also pronounced itself in the statement. Carlos Cruzat, the president of the Kiwi Committee, stated that the orchards of the regions of O’Higgins and Maule Sur had been affected by the storms and that they were evaluating the damages. According to Cooperativa.cl, the storms affected blueberry, cherry, pear, and peach crops, among other crops. The areas most affected were the sectors of ​​Mostazal and Rengo, in O’Higgins, and the province of Linares, in Maule. Some producers had reported total losses.